Identifiers: Putting a small bar or square of stick-on Velcro on the keys that you want to identify readily greatly helps in the early adjustment stage i.e. the index fingers of both hands on the home row; the function key; the control key - whatever key you use frequently and need some extra help to locate in the beginning. Protective Skins: We now have clear or black, flexible silicone skins that fit beautifully over the EZR 2030 keyboard (not available for the 2020 - sorry). These are great for total protection of your keyboard from dust, debris, and spills. The black version also allows you to easily add another legend (QWERTY for Dvorak labeled keyboards, or vice versa). Check the order page for this product. Cleaning: We have found that frequent cleaning of the keybaords is very important. Debris of all sorts may accumulate under the keycaps after several months of use, but can be eliminated easily regularly using a vacuum over the keycaps to remove dust and debris, or by using a compressed air product, such as DustOff, to blow out anything that may be resting in unwanted places. Gently lift the affected keycap up from the bottom until it clicks open, like it's on a hinge. For the vertically oriented keys, lift from the right side up, hinging on the left hand side. Check under the keycap, using a flashlight if needed, to see if there are crumbs (!) or dust particles collected there that may be interfering with the contact to the keyboard, being careful not to disturb the double-scissor mechanism, if possible. The best way to clean this area is to use the pressurized air. If you do happen to lift the entire keycap and dislodge it from the scissor mechanism, see the next section "Reassembling keys" for instructions. If you know that there is trouble with the double scissor mechanism, contact us also for the possibility of replacement of these parts. Check the silicon dome at the center of the key structure -- is it mushy or off-center? You may want to check another key that is operating correctly in order to compare the structures and operating mechanisms. Once you have examined the key thoroughly, place the keycap back directly over the underlying structure and gently but firmly press down. The keycap should click back into place. Try it now and see if any difference can be noticed. Should the little rubber domes become worn out, please contact us to obtain replacements. If they have simply become loose, a single drop of superglue under them in the center of the key mechanism will hold them firmly in place. 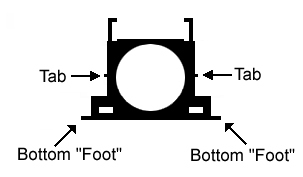 Hold the double, connected piece, so that the "feet" are in a downward direction towards the keyboard. 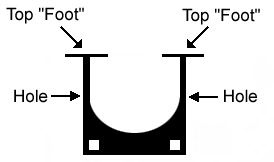 The "top feet" of Piece #1 should be facing the top of the keyboard and the "bottom feet" of Piece #2 should be facing the bottom of the keyboard (like the "Top-view" above). Lay the scissor mechanism flat against the keyboard and press the bottom feet into place. You will hear a "click" sound (2.). 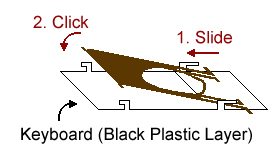 Once the scissor mechanism has been clicked into place correctly, the keycap is centered over the mechanism and pressed into place gently, but firmly. Again, you will hear the keycap click into place at the top and at the bottom of the keycap. 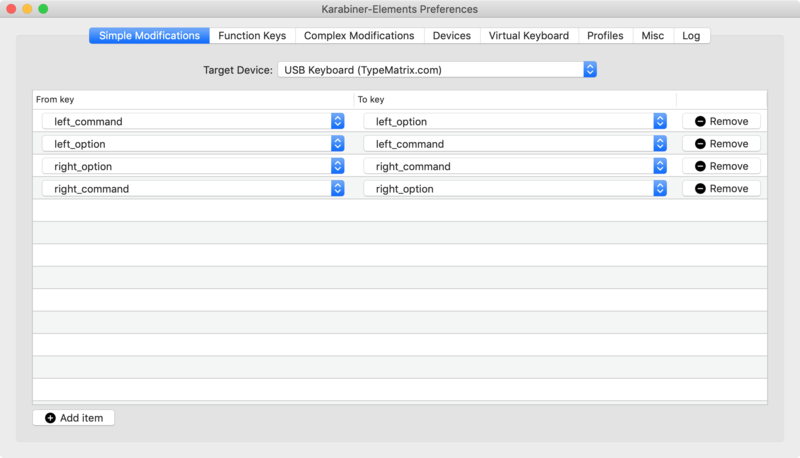 KeyRemap4Mac (now called Karabiner) is the tool for the job. Repeat steps 1 and 2 and replace "L" with "R"
Belkin USB to PS/2 Adapter Part #F5U119-E - Research and feedback from customers has now led us to recommend the use of the Belkin USB adapter for all Mac applications. We no longer offer it for sale online, but you may contact us or shop on any of the sites where Belkin products are sold. Y-Mouse Keyboard and Mouse adapter for USB - available at http://www.ymouse.com/ymouse/whym08.php. We know this adapter works, although it is a bit expensive at $49.95. We will continue to add to this list as we learn of other acceptable devices. Swapping Command and Option: We often get asked if it is possible to switch the command and option buttons for our Mac users. We found a good set of instuctions at http://www.macobserver.com/tip/2006/03/13.1.shtml. Each of these programs contain unique features, so you must try them out to see which you prefer, and then purchase them online from the separate companies. Then click the Done button. The rest of the logon process will continue as usual. Different keymaps for laptops: The following is somewhat of a specialized setup mailed to us, but we're posting it in hopes that it may help other linux users. The "Application" or "Menu" key has no real use and can be modified as you see fit. It is keycode 117. If you use a .Xmodmap file, here is a sample that changes the "Start/cut" button on the 2030 model to Control (something Linux/Unix users frequently request). We're told this works for most *nix flavours, but some modification may be required for you. If you want to modify the behaviour of other keys, use the "xev" command and then hit the key in question to get the key name.